New Pond's Pimple Clear with clinically proven Active Thymo-T Essence, a unique anti-pimple combination formulated with thyme and pine oils. Difference you can see in just 3 Days. Modern life is putting more pressure on our skin than ever before and an urgent need exists for clinically proven pimple products. Pond's first revolutionary Lock + Clear technology, which targets pimple germs at the root and help cleanse it away. With regular use, choose clearer skin! Difference you can see in just 3 Days. The only face wash with Thymo-T formula which is clinically proven to visibly reduce pimples in 3 days - result is clearer skin! Activated Thymo-T Essence is a powerful ingredient a patented by The Pond's Institute which targets pimples and effectively works on the 10 pimple problems and prevents them from coming back. Explore the entire range of Face Wash available on Nykaa. 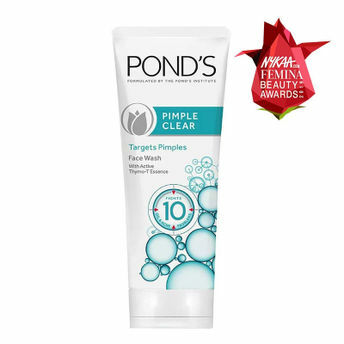 Shop more Ponds products here.You can browse through the complete world of Ponds Face Wash .Alternatively, you can also find many more products from the Ponds Pimple Clear Face Wash range.